EXCLUSIVE: How Would You Survive The Purge? The TV Cast Speaks! Chuck Creekmur talks to the cast of The Purge TV show to see what they would do if the murderous holiday was real. “The Purge” television series makes its television debut Tuesday Sept. 4 on both the SyFy and the USA Network at 10 pm EST/PST and, in this Trump Era, fiction and reality smash each other like battering rams. The Purge, in cinematic dystopia, started in 2013 with the movie where The New Founding Fathers of America pass a 28th Amendment that legalizes all crimes (murder included) for 12-hours on one night per year. More than anything, murder is on the menu. The show follows the premise, but allows for deeper character analysis and development. Nevertheless, the concept is horrifying to the point where some have even accused the movie of inspiring real-life events. On a sweltering day, I visited the set of the TV incarnation of “The Purge” on the outskirts of New Orleans. The set was stunning in an end-of-the-civilized-world kind of way and truly evoked a dark possibility if the nation doesn’t pull the reins on its destiny. In one particular scene, the walls are plastered with signs. They say: “End Child Incarceration,” “Don’t Let Them Break Us Apart (with the United States split),” “Stop Killing Her” and “You Can’t Kill Us.” The PA’s and set personnelle scuttle back and forth, preparing for re-shoot after re-shoot until they reach perfection. 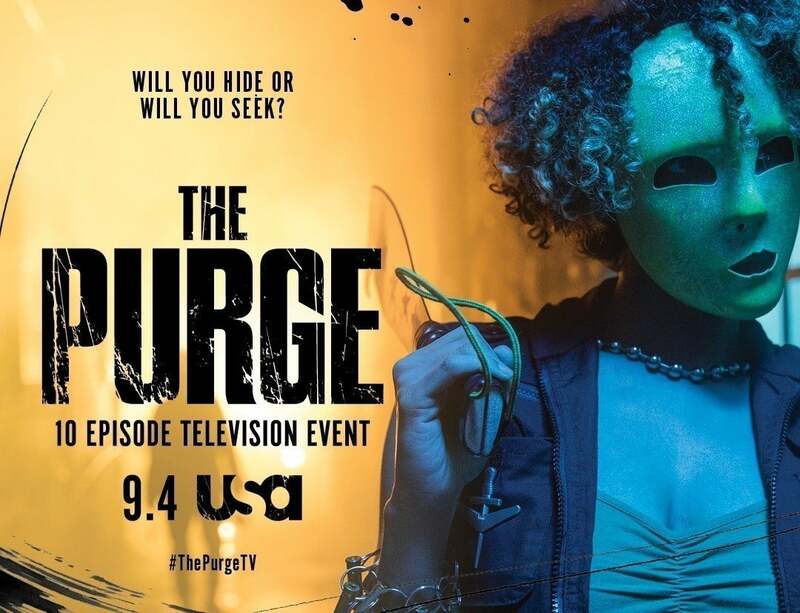 The entire 10-episode series follows a single Purge night with numerous plots to go with it. Miguel (Gabriel Chavarria), a Marine, risks it all on the night of macabre for his sister Penelope (Jessica Garza) who is in a pro-Purge cult. An upwardly mobile couple played by Rick (Colin Woodell) and Jenna (Hannah Anderson) rub shoulders with the New Founding Fathers of America, but realize their ideologies differ greatly. Jane (Amanda Warren) decides she will use the Purge to help her rise in her investment firm and feels an assassin will help greatly. Finally, there is Joe (Lee Tergesen), a suburban dad that dons a mask while listening to pro-Purge motivational lectures. These actors play roles, but how would they approach 12 hours of mayhem that could result in death? Read them below and also add what you would do in the comments. "The Purge" debuts on Sept. 4 at 10 p.m. on USA and Syfy simultaneously.